If you're thinking I missed the shortcake boat, you're right. I made the wrong recipe for this week on accident! Never fear, though, since any Dorie treat is guaranteed to be delicious. These Shortcakes were no exception. I only made half a batch because I almost passed out when I read the recipe and did a quick "butter per serving" approximation. Before you go calling me Ellie Krieger , I do bake out of Dorie's lovely book often enough that a little butter doesn't scare me- I know you're all SO surprised. Even so, lots of butter, with lots of cream (so essentially more butter) and not that many servings left me a little nervous! I'm not sure why I kept avoiding this recipe for these reasons, especially since I've openly confessed my love for pastry cream which is much more deadly, nutrionally speaking! So, back to my faulty logic, I halved the recipe and used a cookie scoop to make smaller shortcakes. Piled mile high with berries, no one noticed. Then I topped them with lots and lots cream, because apparently I don't count the calories in the garnish in my crazy reasonings! I have to say, this recipe is simple and easy and a good use of cream if your container is about to go bad (I'm told some people don't bake often?) It came together in a hurry, only required a few minutes in the oven, and was extremely versatile. And these tasted great, butter, cream, whipped cream and all. A definite make again! Find the recipe here- Cathy is one of my favorite TWD bakers (thanks for the great choice!) And if you don't have all your weeks mixed up like I do, you can see the beautiful Raisin Swirl Bread from the rest of the TWD group. Hopefully I'll sneak that one in later this week! I want to say, I love the swirl in your shortcake but I won't. You will love the bread, when you make it and you sure made up for it with that beautiful shortcake. It came out looking grand even though you tell us, they were small. Right week or not, you can't go wrong with these shortcakes. And adorable Baby Strawberry is growing so fast! What are you feeding that girl?!? Your shortcakes look delicious! I loved them too. Look at all those berries! Perfect for summer. The bread is delicious, I'm sure you will love it! Your shortcakes look tasty. I loved them. I also love Ellie Krieger. I need her if I'm going to continue to bake with Dorie and still wear the same size clothes . :-) Your baby is gorgeous!!! Oh well at least this was a great recipe too. Your little one is a cutie! I love your shortcakes, this was a great recipe too! You will absolutely love the bread. Great shortcakes! And what a cutie enjoying it! This is a wonderful treat for this time of year! Baby strawberry is the cutest of the cute! Great photo. We loved the shortcakes here too. Mmmm buttery short cakes look delicious! I wish I had one for breakfast right now. Butter makes everything taste great! That and kosher salt. Your shortcakes look wonderful! Your baby is adorable too! great job on the shortcakes!! My little one just got his first Dorie treat too! Your little strawberry is so sweet!! Too cute! OMG that picture is too sweet! Love it! Love all your perfect reasoning about the butter and cream. And you're right, no calories in garnishes! What a sweet photo of your baby! I also freak out about the amount of butter in a recipe but then conveniently ignore the whipped cream. There's something more tangible about butter! Ciao ! Your baby is wonderful Ann !! 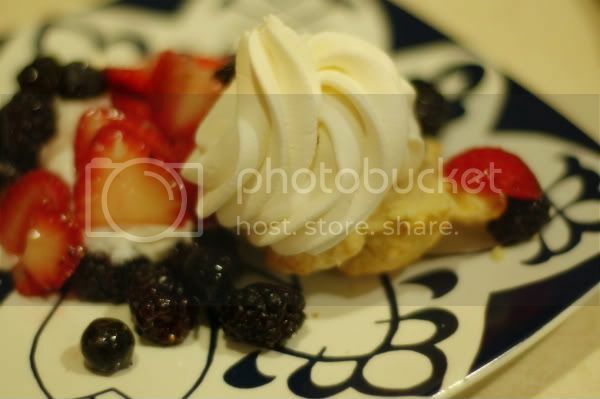 I loved the shortcake too. I think the good of the fresh berries balance the bad of the shortcakes for a dessert that is actually guilt-neutral. 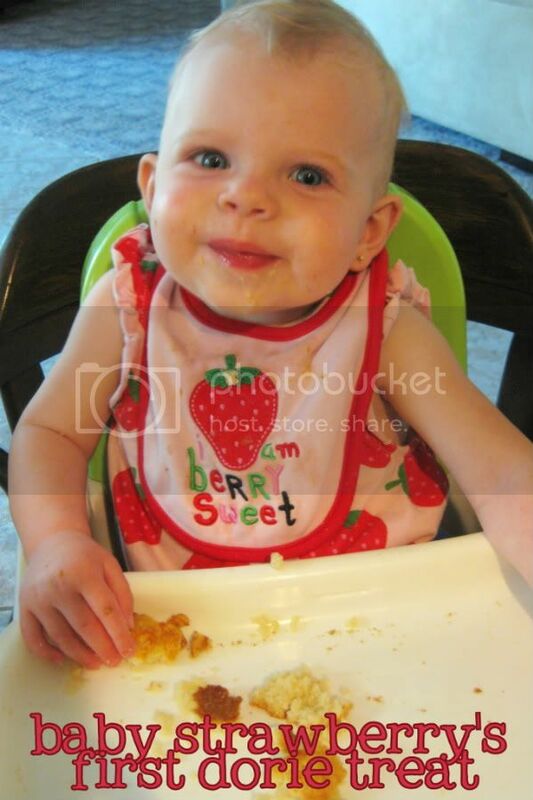 How sweet that the baby is dressed in strawberry clothes. Great recipe!!! 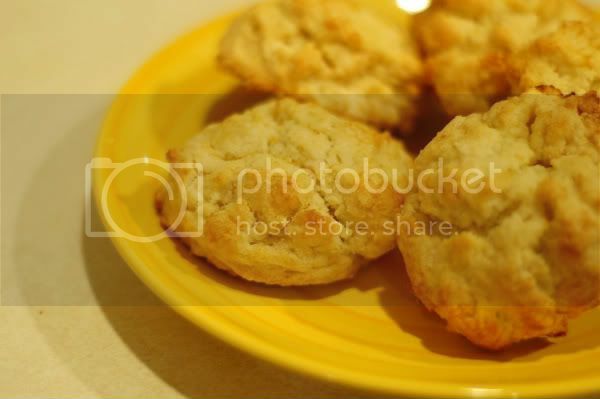 great shortcakes, they look delcious!!! love the pics too!